About 14 months before the release of this film the studio fired its director because of misconduct allegations. They never bothered to replace him. Even with directors, there are so few movies worth paying the price to see in theaters. Now imagine trying to make a good movie without a captain. It's virtually impossible. Sure, they had a staff of high level executives working to make the decisions, but you need someone to break the ties and make the tough decisions. That is what a good director does. Needless to say, this movie is pretty much a hot mess. Thankfully it is only 80 minutes long so you don't have to endure too much of it. 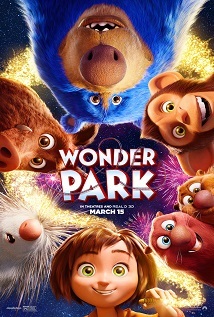 The pacing is all over the place, there is a whole weird thing going on with the main character's mom that will probably need a lot of careful explanations to curious children, and the action in the park is limited to about 20 minutes. It almost feels like it's over before it starts, but then there is still another 20 minutes to go. The bottom line though is will the kids like it? Probably. Is it going to become one of their favorites? No. Is it worth the price of several tickets and concessions? Definitely not. There are a lot of kids' movies coming out in the next few months. Many of which will be better than this one. Save your money for things like DUMBO. And if your kids really want to see this one, rent it when it comes out digitally in a few months, but my guess is that everyone will have forgotten about it by then.